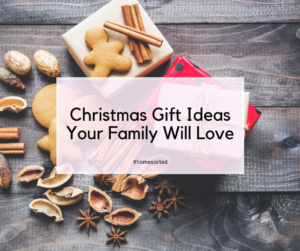 Christmas Gift Ideas Your Family Will Love - Home Sorted! If you’re anything like us, your Christmas planning is well under way, which can only mean one thing! It’s time to figure out what gifts your loved one will truly adore. Buying gifts for the kids in your life can be a lot of fun – if not daunting to begin with! We recommend looking for gifts that offer a certain ‘cool factor’ to kids, but ones that are also promote learning and educational play. Lego is a great option, along with dress ups, craft supplies and puzzles. For teenagers you can’t go wrong with electronics. Items such as smartphones, wireless headphones, fitness trackers, game consoles, and hair styling tools are always a popular choice. Smaller gifts include gift vouchers for their favourite stores or online streaming services like Netflix and Spotify. When selecting gifts for the man or woman of your life, it’s always important to consider their personality and what you want the gift to say! If you’re still unsure, we recommend selecting a gift that you can enjoy together. Tickets to the cinema, a show you’ve both been wanting to see, or a day trip to your favourite winery are always well received gifts! Like any gift, it’s always a good idea to consider what your parents or in-laws like and how they spend their time – this is especially important if they’ve retired. Gardening tools are perfect for those who love getting their hands dirty. Matching coffee cups, wine subscription services or recent family photos are other great ideas. When it comes to spoiling your grandparents, you can’t go wrong with edible items. Think condiments, preserves, spreads, chocolates, and shortbread. You can also extend this to items like speciality tea leaves and coffee beans. When it comes to buying gifts for your friends you can’t go past items that have a personal significance between the two of you. If this can’t be purchased we recommend opting for fun pyjamas, make-up, beer kits, candles or books! Finally, remember to get your shopping done early! There is nothing more frustrating than failing to find the perfect gift with no time to spare.